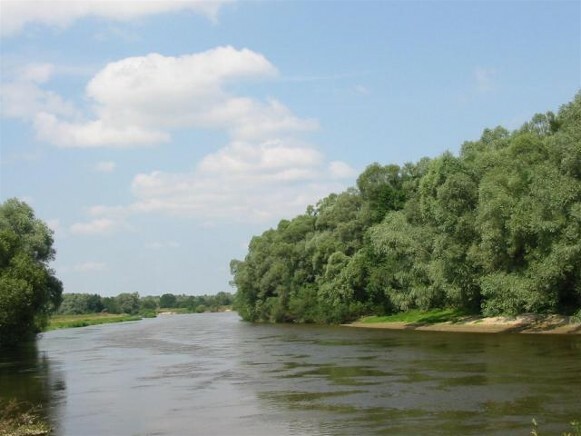 Buh River (Буг; Soviet Ukrainian name: Буг Західний; Buh zakhidnyi [Western Buh]; Polish: Bug). (Map: Buh River.) A right-bank tributary of the Vistula River. The Buh is 813 km long, and its basin is 73,470 sq km in area. It originates in the Podolian Upland in Lviv oblast. It flows through the Buh Depression to the mouth of the Solokiia River and then crosses the Volhynia-Kholm Upland. 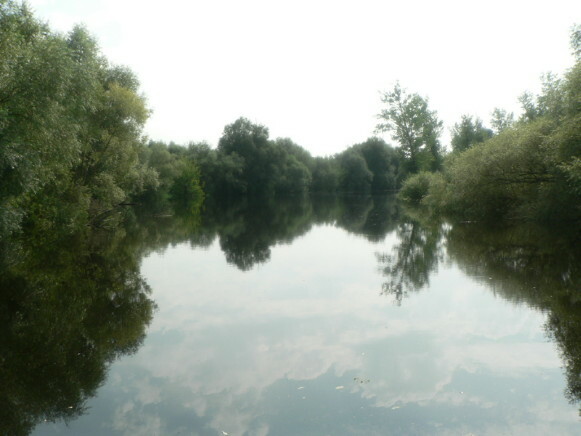 From the town of Dubenky it flows through the Podlachian-Polisian Lowland (average depth 1 m). Its slope is 3 m/km in the upper section, 0.6 m/km in the middle section, and 0.25 m/km in the lower section. The Buh freezes over in late December and thaws in late March. It is navigable (periodically) below Brest. 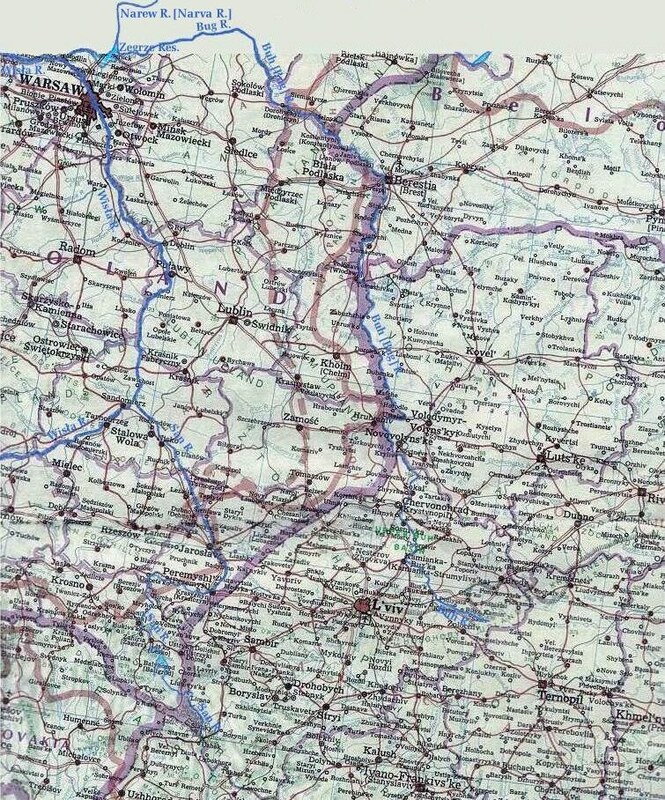 Its tributaries on Ukrainian ethnic territory are the Poltva River, Rata River, Solokiia River, Huchva River, Uherka River, Volodavka River, and Krna River on the left bank and the Luha River, Mukhavets River, Lisna River, Nurzec River, and Narva (Narew) River on the right bank. 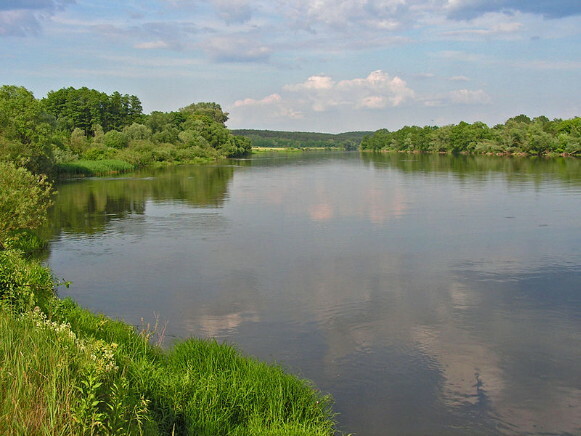 The Buh is connected by canals between the Mukhavets River and the Pyna River (a tributary of the Prypiat River) to the Dnieper-Buh Canal system and by the Narva (Narew) River and the Augustów Canal to the Neman River. From Kryliv in the south to Melnyk in the north the Buh serves as a border of Ukraine, Belarus, and Poland. Since the resettlement of Ukrainians from Podlachia and the Kholm region in 1946, the Buh has also marked the Polish-Ukrainian ethnic border. In 1795–1831 it was a border river between the Russian Empire and the Austrian Empire (in 1807–15 the Grand Duchy of Warsaw, in 1815–31 the Congress Kingdom of Poland). Later the borders of Russian gubernias and Polish voivodeships, as well as the Curzon Line, ran along the Buh. A referral to this page is found in 46 entries.